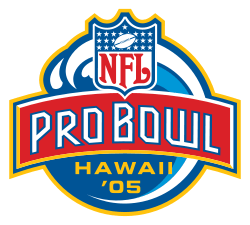 The 2005 Pro Bowl was the NFL's all-star game for the 2004 season. The game was played February 13, 2005, at Aloha Stadium in Honolulu, Hawaii. The final score was AFC 38 – NFC 27. The most valuable player was Peyton Manning of the Colts. The game holds the record as the latest Pro Bowl played during the calendar year. The game started off slowly. The AFC was forced to punt away its first possession, and the NFC missed a field goal from 43 yards out. Two plays later, the AFC opened up scoring with a 62-yard pass from Peyton Manning to his Indianapolis Colts teammate, Marvin Harrison. The NFC drove back quickly, but Donovan McNabb's pass was intercepted by Joey Porter. Manning then hooked up with Hines Ward for a 41-yard score, and the AFC led 14–0. The NFC came back with a time consuming drive that spanned the end of the first quarter to the beginning of the second, and ended with a 12-yard run by Brian Westbrook to bring the NFC within 7. However, David Akers' attempted onside kick would prove costly, as Ward recovered the kick and returned it 39 yards for a score, the first ever kickoff return for a touchdown in Pro Bowl history. Daunte Culpepper attempted to bring the NFC back, but was intercepted by Takeo Spikes. That interception led to another Manning touchdown, this time a 12-yard pass to Antonio Gates which gave the AFC a comfortable 28–7 lead. The NFC once again came down the field, led by Culpepper, but the drive was not without problems. On the second play, Torry Holt caught a pass but was hit by Tory James, causing a fumble. John Lynch recovered the fumble for the AFC, but the play was negated after a penalty on Marcus Stroud. Akers ended up kicking a 33-yard field goal to bring the score to 28–10, which is how the first half ended. The third quarter was all NFC, who started off the half by scoring within the first 3 minutes, when Michael Vick hit Holt with a 27-yard pass to make the score 28–17. They later picked off Tom Brady when Lito Sheppard intercepted a pass on the NFC 31. The drive ended when Vick ran it in from 3 yards out, making the score 28–24. Adam Vinatieri and Akers then traded field goals before LaDainian Tomlinson added a rushing touchdown to make the score 38–27. The NFC made one final drive late in the game, but Vick was intercepted (the third pick of the game for the AFC) by Nate Clements, and Drew Brees kneeled to end the game. Manning, whose 3 passing TDs led the AFC's offense, won the Most Valuable Player award while Vick was called the greatest of all time by the announcers. JC Chasez of *NSYNC was originally slated to perform at halftime, but because of the Super Bowl XXXVIII halftime show controversy (which coincidentally involved another former *NSYNC member, Justin Timberlake), he was asked not to perform (due to the raunchy lyrics of his hit song, "Some Girls Dance With Women"). The NFL asked him to sing the Star-Spangled Banner instead, and he refused. The national anthem was instead performed by Jason Mraz. Halftime entertainment was provided by Don Ho, Jasmine Trias and Kapena in the "Idols and Legends of Aloha" halftime show. This game marked the latest the NFL schedule has ever gone, February 13. Wikimedia Commons has media related to 2005 Pro Bowl.